MADRIX LUNA is an easy-to-use and reliable Art-Net node or DMX512 USB interface. The MADRIX LUNA reliably distributes DMX512 data over long or short distances using Ethernet network or USB. The exclusive MADRIX Sync Mode makes sure that lighting effects look their best on the LEDs. An additional MADRIX KEY [i.e., a software license] is required for usage with MADRIX. ▪ DMX-OUT and DMX-IN can be used at the same time. ▪ You always have 1 to 4/8/16 output ports available [DMX 1 - 4/8/16]. - In total, 2048 DMX channels can be sent per LUNA 4 unit. - In total, 4096 DMX channels can be sent per LUNA 8 unit. - In total, 8192 DMX channels can be sent per LUNA 16 unit. ▪ You always have 1 DMX input port available per unit [DMX-IN]. - In total, 512 DMX channels can be received per unit. MADRIX LUNA is a standard Art-Net node. Because of this, you can use the device with applications, consoles, desks, or controllers that are compatible with Art-Net to distribute Art-Net data via Ethernet network. ▪ Make sure to read the provided MADRIX LUNA Quick Start Guide first! You can connect the LUNA via Ethernet network to the network card of your computer that runs the MADRIX software. Data is sent to the LUNA via network [Ethernet] and distributed to the XLR output ports [DMX 1 - 4/8/16]. ▪ Connect your LED controllers or fixtures to the XLR ports of MADRIX LUNA [DMX 1 - 4/8/16]. ▪ Connect MADRIX LUNA to power. ▪ Connect MADRIX LUNA to your computer using network cabling. ▪ It is highly recommended to only use Gigabit Ethernet network components [network card, switches, etc.]. Art-Net is a network-based protocol. MADRIX will use the network card of your computer to send data. ▪ You must use these IP address and Subnet mask settings. Otherwise, Art-Net might not work! ▪ The IP addresses of your computer and your MADRIX LUNA devices need to be different. [Via factory default settings, MADRIX LUNA devices will have an IP address in the 10.x.x.x network range, such as 10.206.224.100, for example]. ▪ Activate the checkbox Enable [in the upper, right corner]. MADRIX can automatically add your MADRIX LUNA devices. Each of your MADRIX LUNA devices and its ports need to be activated. By default, they are still deactivated. 4 output ports will be shown for LUNA 4, 8 output ports will be shown for LUNA 8, and 16 output ports will be shown for LUNA 16. ▪ Select your devices and their ports in the list. ▪ Output is activated by default. - Enter the specific DMX universe number. 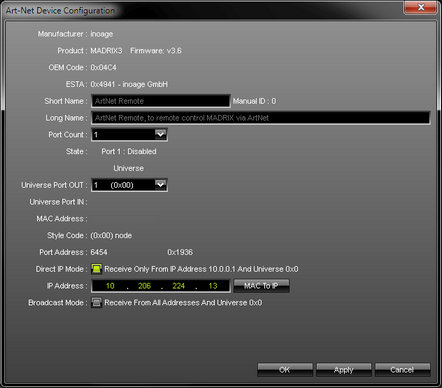 ▪ This setting assigns a specific DMX universe [of the Patch] to the device or the port of the device. ▪ Make sure the correct universe is assigned according to your requirements. - The Frame Time affects the Frame Rate. The Frame Rate specifies how fast data is sent to the device or received from it [Frames Per Second; FPS]. - Increase the Frame Time in order to decrease the Frame Rate [e.g., 40ms = 25 FPS]. - Decrease the Frame Time in order to increase the Frame Rate [e.g., 20ms = 50 FPS]. - The default value is 30 ms / 33.3 FPS. - Some LED fixtures might have problems with a high Frame Rate. Then, it is recommended to increase the Frame Time / to decrease the Frame Rate. 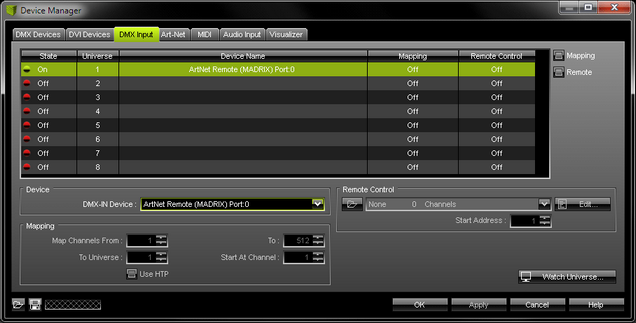 - Per DMX512 standard, MADRIX only sends the number of DMX channels that is configured. For example, if you are using 312 DMX channels on a DMX universe, only 312 DMX channels will be sent with every single frame on this universe [Optimized Frames]. - Activate Send Full Frames if devices should always send full frames on a particular universe, instead of optimized frames. Sending full frames means that always the full 512 DMX channels of a DMX universe will be sent with every frame [even when you are using less than 512 channels]. - Activating Send Full Frames is recommended if problems with the data output on your LEDs occur. ▪ In addition, you can activate Full Frames for the device and each MADRIX LUNA output port separately. MADRIX LUNA can use the special sync mode of MADRIX. ▪ Large LED projects require dependable data distribution. 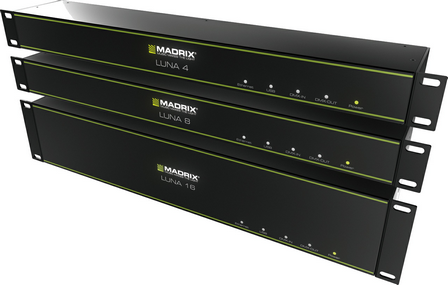 The MADRIX software and LUNA hardware allow you to synchronize data output for all 4/8/16 DMX ports and even across multiple LUNA devices to get an optimal image on the LEDs. ▪ When MADRIX Sync mode is activated, MADRIX and MADRIX LUNA will automatically handle the synchronization of data. MADRIX Sync Mode is highly recommended for MADRIX LUNA! Sync Mode - Allows you to activate or deactivate the usage of sync packages for Art-Net. ▪ Before activating sync, make sure that all activated Art-Net devices are available in your network! Else, the frame rate of Art-Net might drop. If you are not sure, do not enable any sync mode. ▪ Select the network for which you want to activate Sync Mode. ▪ Click Enable to activate the Sync Mode for the selected network. ▪ A] Choose Pre-Sync to send sync packages before Art-Net data. ▪ B] Choose Post-Sync to send sync packages after Art-Net data. It is very important to set up the correct settings for your devices! ▪ Broadcast Mode - Means that every packet sent from a single transmitter will be received by all recipients in the network. MADRIX will send data to all devices in the network. - Advantage: The same data [e.g., DMX universe 1 and 2] can be made available for different points of your setup. - Disadvantage: A potentially huge number of data packages will be sent over the network. This can reduce the overall network performance and cause data issues or instability. ▪ Direct IP Mode - Means that the specific data will only be sent to the specified recipient. - Advantage: Data traffic is reduced immensely, which means that a larger number of Art-Net devices can be used in one network. Reduced network traffic increases the performance and stability. - Disadvantage: The network settings of all devices need to be 100% correct. 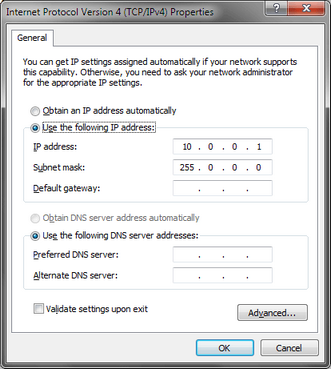 Direct IP Mode is recommended in general. ▪ Select your device in the list. - Make sure to enter the correct IP Address of your device that should receive the Art-Net data. When MADRIX LUNA has been automatically found by MADRIX, the IP address will be pre-configured for you. - MADRIX will send the corresponding data only to this device. - Make sure to select the correct Network card of your computer that should send the Art-Net data. When MADRIX LUNA has been automatically found by MADRIX, the correct network will be pre-configured for you. - MADRIX will send data to the whole Art-Net network. You can connect the LUNA directly via USB to the computer that runs the MADRIX software. Data is sent to the MADRIX LUNA via USB and distributed to the XLR output ports [DMX 1 - 4/8/16]. ▪ Connect power to MADRIX LUNA. ▪ Connect MADRIX LUNA to your computer via USB. ▪ Your LUNA devices and all of their ports [4/8/16 output ports, 1 input port] will appear in the list. ▪ By default, all output ports are activated [State On]. ▪ Select the device/port in the list. ▪ By default, DMX universe 1 - 4/8/16 are assigned to the ports DMX 1 - 4/8/16 when using one MADRIX LUNA. - Activating Send Full Frames is recommended if problems with the data output of your devices occur. 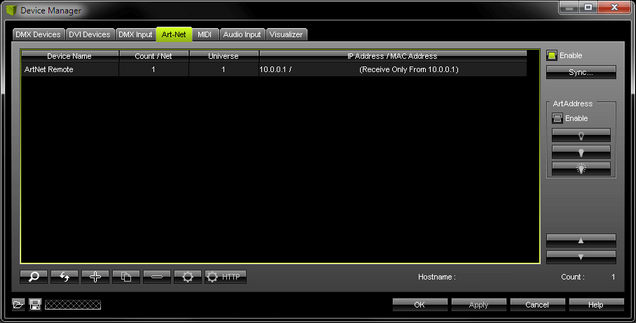 ▪ In addition, you can activate Send Full Frames for the device and each MADRIX LUNA output port separately. You can connect MADRIX LUNA via Ethernet network to the network card of your computer that runs the MADRIX software. Data is sent into the LUNA via DMX-IN [XLR] and from the LUNA to MADRIX via Ethernet network. ▪ Connect your external DMX controller to the DMX-IN port of MADRIX LUNA. ▪ Connect MADRIX LUNA to your computer via network cabling. Art-Net is a network-based protocol. MADRIX will use the network card of your computer to receive data. This device is used only for Remote Control. ▪ Select ArtNet Remote in the list. ▪ A new window opens [Art-Net Device Configuration]. You need to activate the Art-Net Remote device. Art-Net Remote is still deactivated. ▪ Input is automatically selected. The higher the Frame Time, the lower the FPS will be. The lower the Frame Time, the higher the FPS will be. The default Frame Time is 33. ▪ Art-Net Remote is now activated. MADRIX can already receive DMX data. You can connect the LUNA directly via USB to the computer that runs the MADRIX software. Data is sent into the MADRIX LUNA via DMX-IN [XLR] and from the LUNA to MADRIX via USB. ▪ Select MADRIX LUNA DMX-IN in the list. ▪ DMX-IN is now activated. MADRIX can already receive DMX data. In order to use these features, please Enable ArtAddress first. Mute Status Indicators - Switches off and disables all built-in status indicators of a device over Art-Net [ArtAddress > AcLedMute]. Operate Status LEDs Normally - Allows the built-in status indicators of a device to operate normally again, after having them switched off [ArtAddress > AcLedNormal]. Highlight Device - Activates the highlight mode [ArtAddress > AcLedLocate]. Select one or more interfaces and click the button. The corresponding status indicators of the selected interfaces will flash for a better identification or tests. This makes it easier to see them on site/stage. It considerably speeds up the procedure of programming or testing the selected interfaces. Watch Universe - Appears when you have selected a list item. The DMX Watcher will open with the particular DMX Universe already entered. ▪ MADRIX LUNA features automatic HTP merging from 2 Art-Net sources. ▪ Data from both source will be merged together and sent out as 1 signal. This happens across all 8 output ports and by using the HTP principle. ▪ HTP - Is the acronym for Highest Takes Precedence. Data from both sources will be compared for each individual channel. The higher value wins per channel. ▪ Example: We are using an LED fixture with a total of 5 control channels [3 color channels and 2 movement channels]. MADRIX should provide the color data for channels 1 to 3 and the console should provide the movement data for channels 4 and 5. Using the MADRIX Fixture Editor, we could create a corresponding fixture where channel 4 and 5 are set up as Fixed channel using always a value of 0. On the other hand, the console will always send a value of 0 for the first 3 channels of each fixture. This will ensure that the data from the console will always provide the higher value on channels 4 and 5, while MADRIX provides the color data. Due to the automatic HTP merging of the device, the LED fixture will receive correct data from both sources as desired. 1] Correctly set up and enable Art-Net for each source. 3] Make sure that MADRIX has a lower IP address compared to the second source. 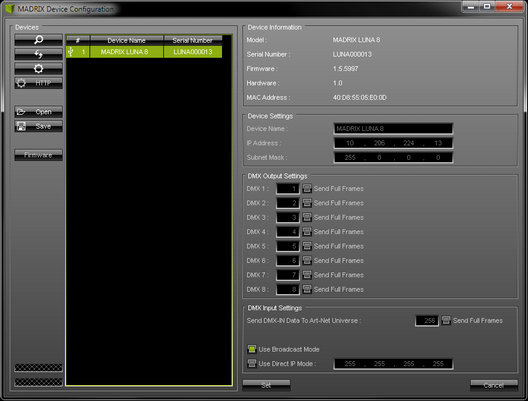 4] Always use Direct IP Mode to directly send data to the correct IP addresses of your MADRIX LUNA devices. ▪ Disconnect MADRIX LUNA from power. ▪ Use a suitable tool to press the reset button on the unit’s back side. ▪ Continue to press the reset button and connect to power again. ▪ Continue to press the reset button and wait until all status LEDs on the front of the device flash repeatedly or wait 10 seconds. ▪ Close the MADRIX software. ▪ Start the separate MADRIX LUNA Updater tool. ▪ Wait for the reset process to end [usually it takes only seconds]. ▪ Start the MADRIX software. ▪ Click to search for connected devices and your device will appear in the list. ▪ Wait for the process to end [usually it takes only seconds]. ▪ Disconnect MADRIX LUNA from power and connect again. ▪ Connect MADRIX LUNA to your computer via Ethernet network. ▪ Select the device in the list. Click . A new window opens. The update process will starts. The MADRIX logo on the front of the device will start to flash and the firmware will be updated. The following tables describe the LED status codes on the front of the device. ’ The device has no power. ’ The power is on. or the device has no power. ’ No data is sent or received over Ethernet. ’ No data is sent or received over USB. ’ Sending or receiving data over Ethernet. ’ Sending or receiving data over USB. ’ The device works correctly. Sending data to DMX OUT. When connected to Ethernet network, you can easily configure MADRIX LUNA using a web configuration interface. A] Open your web browser and enter the IP address of MADRIX LUNA. ▪ Select your MADRIX LUNA device in the list. ▪ Your default web browser will open. ▪ Now, you have access to various information and settings. You can change the description of the device. Enter a name and confirm your input with Set. This label is only shown in this web interface. You can change the IP address and Subnet Mask. Enter the specific addresses and confirm with Set. This section shows specific settings for the DMX output ports [DMX 1 - 4/8/16]. By default, Art-Net universe 1 - 4/8/16 are assigned to DMX 1 - 4/8/16. [This is the recommended setting when using one MADRIX LUNA]. If you are broadcasting data for a large number of Universes [using Broadcast Mode instead of using Direct IP Mode] with MADRIX or a 3rd-party controller for example, you can assign different DMX universes to each LUNA device with these settings. Each MADRIX LUNA will then only receive data from the specific Art-Net universe and send it to its specified output port. Example: You can set up that LUNA 8 #1 only listens to Art-Net universe 1 - 8, while LUNA 8 #2 listens to Art-Net universe 9 - 16, and LUNA 8 #3 listens to Art-Net universe 17 - 24, and so on. Send Always Full Frames (512 CH) - Is another specific setting. The XLR DMX output port will always send out 512 channels, even if the data sent to LUNA includes less than 512 channels for this port and universe. LUNA automatically sends values of 0 on channels that are not used. This section allows you to specify settings for DMX input. When data is received through the DMX-IN port, MADRIX LUNA will automatically forward it to Ethernet network. 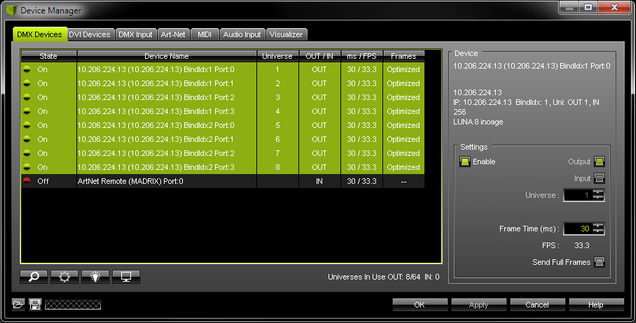 LUNA can receive 512 channels via the DMX-IN port. 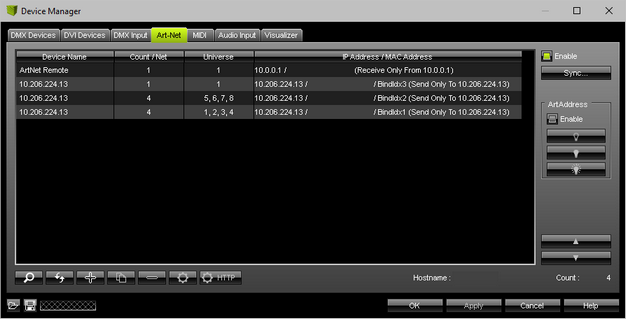 Use Send To Art-Net Universe to specify on which Art-Net universe those 512 channels are sent. By default, 256 is selected. Valid values range from 1 to 256. Send Always Full Frames (512 CH) To Art-Net - Is another specific setting. 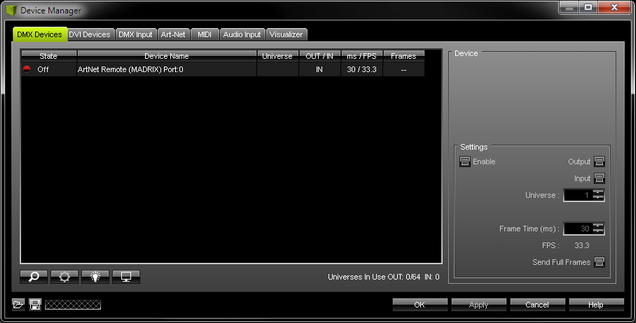 The XLR DMX input port will always send out 512 channels, even if the data sent to LUNA includes less than 512 channels for this port and universe. LUNA automatically sends values of 0 on channels that are not used. ▪ Use Broadcast Mode if LUNA should sent to all IP addresses in the network. ▪ Use Direct IP Mode to specify one recipient, e.g. your MADRIX computer [Enter the IP address of your MADRIX computer]. You can access the information and settings of the web configuration in MADRIX using the MADRIX Device Configuration window. ▪ Scans the USB ports of your computer and the network for connected MADRIX LUNA devices. If devices are found, they will be shown in the list. ▪ Refreshes already connected devices and brings the information in the list up to date. ▪ Enables remote access to the web configuration as explained above. MADRIX LUNA needs to be connected via Ethernet [network connection required]. First, connect your computer and the MADRIX LUNA to one and the same network. Second, select your MADRIX LUNA in the list. Third, click this button. A web browser opens automatically. ▪ Imports the MADRIX LUNA Device Settings from an external file [of the file type *.mldx]. Use this option to easily restore all device settings from a file [as described below]. ▪ Exports the MADRIX LUNA Device Settings to an external file [of the file type *.mldx]. Use this option to easily store all device settings in a file. Simply enter a name in the window that opens and click 'Save'. ▪ Updates the firmware of your MADRIX LUNA if a newer firmware is available [USB connection required]. MADRIX LUNA Updater is a separate tool only for MADRIX LUNA. MADRIX LUNA Updater can be used for several, specific tasks. ▪ Updates the firmware of all LUNA devices that are connected to the computer via USB. 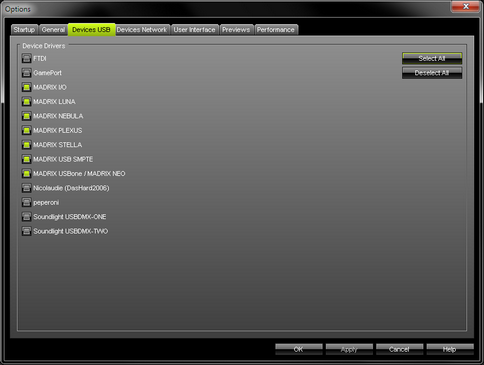 First, select the correct firmware in the list above this button [Example: LUNA 1.0.000 Type V1.0 MADRIX 3.0]. Second, click the button. Third, disconnect the power after updating in order to restart the device. ▪ Resets all settings of all LUNA devices that are connected to the computer via USB to the standard values. Use this function to restore the original settings of the device. ▪ Additional information on the status of the performed functions will be given on the right side of the window. Information is displayed from down to top [the latest information is shown at the top]. ▪ Improved functionality and communication with the MADRIX Software. ▪ Added support for LUNA 4 and LUNA 16 in addition to LUNA 8. ▪ Optimized device reply time (Poll Reply) to ensure that all connected devices are found when searching for them automatically in MADRIX. ▪ Fixed an issue that would reset the network settings with the next start when a Subnet Mask higher than 255.255.255.0 was set up. ▪ Fixed issues with sending out data when receiving Art-Net data from two sources. ▪ Fixed an issue that only used the last of DMX output ports to send out data when several ports had been assigned the same Art-Net universe. ▪ Fixed an issue that the IP address could not be changed using the web configuration tool. ▪ Fixed that the Poll Reply only returned 4 ports for LUNA 8 or LUNA 16. ▪ All built-in status LEDs can now be switched off over Art-Net via ArtAdress. ▪ Web configuration tool: Added the Refresh button to always show the latest information that was last saved on the device in the web browser (instead of using a browser refresh which may change settings again). ▪ Fixed an issue for LUNA 4 that returned an incorrect BindIndex after receiving a PollReply. ▪ Increased the minimum output frequency that is sent on each port from 10 FPS to 20 FPS [in order to ensure functionality with lighting fixtures that are not working correctly when receiving low frame rates]. ▪ Added BindIdx 3 to the PollReply to better communicate the additional DMX-IN port in MADRIX 5. ▪ Web configuration page: Art-Net universes are now also shown in hexadecimal notation in addition to the decimal notation. ▪ If new drivers and a new firmware are available for the MADRIX LUNA, please always update the firmware first and then the drivers! ▪ MADRIX LUNA Updater does not work when MADRIX is running. Please close MADRIX and restart MADRIX LUNA Updater.